In this article, we shall discuss the Vedic Math sutra "vertically and crosswise". 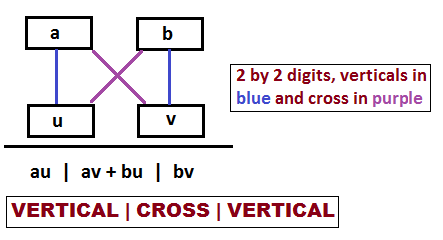 This is the General Formula which is applicable to all the cases of multiplication. You will found this method very useful in division also that we shall discuss later. In the previous sutras, you subtracted crosswise; now you will multiply crosswise. The numbers are written from left to right. The previous examples involved no carry figures, so let us consider this case in the next example.